I'm back on my most favorite Design Team! Yes, you guessed it...Doodle Pantry. I have really missed being a part of this team, so I am very happy to be back on board. There have been a lot of changes in the design team since I've been gone, so please take a look at some of the other member's blogs. We have some very talented ladies on this team. My card is using the new Carousel Deer set. Everyone knows by now how much I love her carousel series. I did, however, choose to use the deer without the pole. I love to show how versatile her sets really are. Laurie always gives us the image without the pole, as well as with it, so you can choose how you want to use it. I first printed the solid blue and the printed blue digital papers that come with the set using white card stock. I used the solid print with my Silhouette Cameo and a snowflake spread cut file from Silhouette's online store. Even though some of these snowflakes were incredibly small, they cut beautifully. I mounted this on white card stock. Using the clear Sakura Gel Pen, I dotted the entire background to give it a nighttime snowy effect. I printed the deer on white card stock and colored it using Copic markers (deer - E53, E55, E57, E59; saddle & reins - BG72, BG75, BG78; leaves - G29; ribbons & flowers - R46). I then hand cut the deer image and popped it up onto the background using thin foam adhesive. I added mini gold half pearls onto all the places that had bells showing on the image. I really love the way this came out. I really wish I had super mini bells to put on there. I printed the sentiment from the same set and using two tag punches from Stampin' Up! I punched the sentiment and then the background from the designer paper I printed earlier. I distressed the sentiment with Not Quite Navy ink from Stampin' Up! and using the thin foam adhesive, mounted it onto the background. I then cut two angled strips to give a "faux" ribbon look and added a mini button. Here is a picture of the entire set that you will receive. Laurie has an incredible Labor Day sale going on now until September 6th. You will receive 30% off your cart total. Just use the code LABORDAY14 at checkout. You must have a minimum order of $2.00 for the code to work. 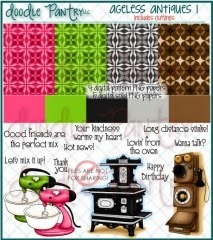 While you are checking out, don't forget to visit the Freebies page. Some items are totally free, and some are free with purchase. This month's free with purchase is Ageless Antiques 1. And don't forget to visit Doodle Pantry's Blog and enter the DPDC50 monthly challenge. The challenge runs each month from 12:00 p.m. on the 1st through the 24th. You can use any image you want to be eligible to win the $15 gift certificate. But, to be eligible to get the free stamp set, you must use a Doodle Pantry image (not just a sentiment). 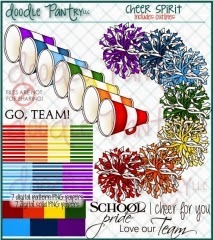 This month, all eligible entries will receive the Cheer Spirit set. Thank you all so much for visiting. Beautiful. I particularly like the way the stars go...like star dust adn shows magic and movement. Yup...great to see you back on the Doodle Pantry team and look forward to your fun interpretations. Isn't that a beautiful horse! Wow, what an incredible design! Gorgeous everything; you really knocked this one out of the ballpark. So good to have you back on the team, Susan! Love it - great design! Your card is so lovely and the stars are perfect. Thank you so much for joining us at MFP's SpeedyTV's Inspiration Challenge and hope to see you again soon. Wow, great card! And can I say welcome back Susan?!!! I can see that you are going to provide quite a bit of inspiration to the team! Love the colors and wonderful image! How fun! You've done a great job, and I really want to thank you for sharing your card in our challenge this week. I really hope that you will stop by again soon. I look forward to it. Love this card...so clean looking and yet so much detail. I love the cutouts and the added sparkle. Welcome back...I look forward to seeing your future projects. Gorgeous card, Susan!! I love the snowflakes!! Congrats being back on this team -- I am glad too, as you rock out cards using these images! Fun colors. This art is delightful. Thank you for dropping by. Sunny sweet smiles from Carole and the DT team at Word Art Wednesday. What a fabulous card. I can see why you love the carousel deer so much. I love how you used the beads. Thank you, soooooooo much, for joining us for the Speedy TV Inspiration challenge. Gorgeous card Susan, I love all the pretty snowflakes. Very pretty card - love all the sparkle. Thanks for playing along with us at 613 Avenue Create. Lovely card, wonderful image for our challenge at Robyn's Fetish Challenges,thanks for joining us this week. Beautiful holiday card. Love your reindeer and the snowflakes Thanks for joining us at Paper Makeup Stamps. Great card and those 'ankle bracelets' are just the cutest idea! Thanks for joining us at 2 Cute Ink and I hope you'll be back again. Oh my, the details on this are beautiful! Love those beads and the images. Great card and we really appreciate you sharing it with us in the MFP SpeedyTV Inspiration Challenge! Welcome back Susan! Love the glittery background and those pearl anklets are sooo cute! You Are One Fabulous Pursen!